If you are not familiar with couscous, that is probably because it is mostly found in many Middle Eastern and Mediterranean cuisines. Fortunately if you are following a gluten-free diet, couscous is not for you, unless it's made with a gluten-free couscous product. If you do find gluten-free couscous, follow the cooking instructions per the instructions on the box how to cook it, since in gluten-free products it can be tricky to achieve the well-cooked outcome that you want. 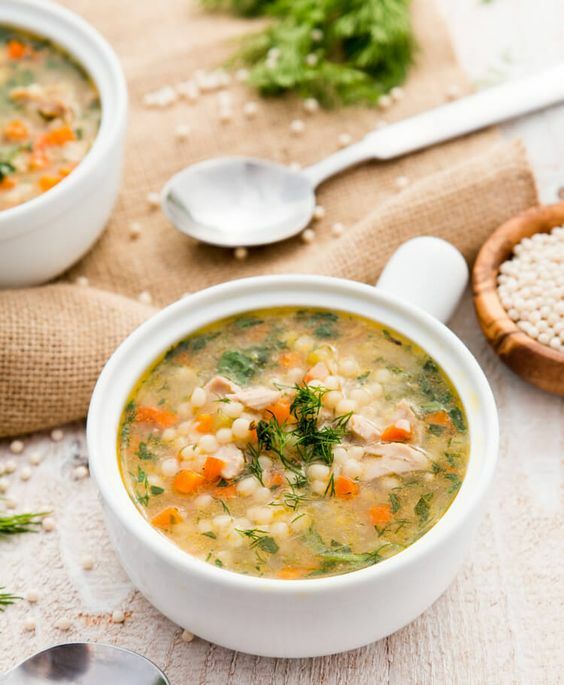 The type of couscous used in this soup is pearl couscous. It is a type of pasta made from wheat flour and semolina, with the size and look of small pearls. We don't eat a lot of pasta in our house, I think probably because of the texture of it, but from all the pastas out there, couscous is our favorite. Maybe because it doesn't really taste or feel like pasta. Couscous is rich in selenium and and helps lower your risk of cancer, while spinach provides you with vitamins K, A, C, as well as folate. In a pot add 6 cups of water, 1 pound boneless and skinless chicken thighs, 2 dried basil leaves, and 3 teaspoons salt. Boil for 30 minutes on medium heat. In a separate pot, heat up 4 Tablespoons of olive oil. Add in onion and couscous. Sauté for 5 minutes, stirring occasionally. Add in celery, carrot, garlic, and 1 Tablespoon lemon juice. Sauté for another minute. Strain water from the chicken into the pot with vegetables. Add in 2 cups of water. Bring water to a boil, then let simmer until couscous is cooked (10 minutes). Shred the cooked chicken. Add it to the pot. Add chopped spinach and fresh dill. Bring to a boil, turn off heat.